Gianluca Busio scored Sporting KC's lone goal in a 1-1 draw with FC Cincinnati on Sunday. A 16-year-old homegrown, Busio made his third MLS start and now has three goals in 367 career minutes. 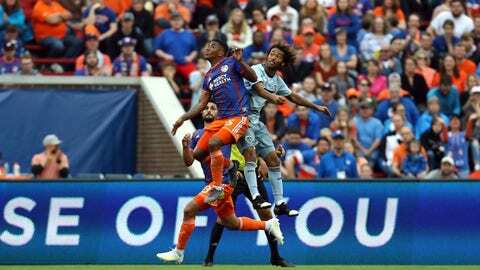 Kelyn Rowe played an arcing pass from near midfield to a streaking Busio near the top of the box, where defender Greg Garza and goalkeeper Spencer Richey — who came off his line — got tangled up, allowing Busio to roll in an empty-netter that made it 1-1 in the 62nd minute.